On Dec 4, the FAANG group of stocks lost $140 billion in a searing market slide. The trading session was symptomatic of a year which has been a tough one for the group. FAANG stocks may have led gains during the longest Bull Run in the U.S. stock-market history, but in 2018 they were weighed down by individual weaknesses and broader market concerns. Analysts now believe that the group’s troubles are far from over. With macroeconomic risks on the rise and a tougher rate environment around the corner, FAANG’s problems may just be getting started. However, analysts believe that though the broader tech sector had a difficult 2018, it remains a good investment option. Small companies focusing on innovation may be better bets heading into next year. 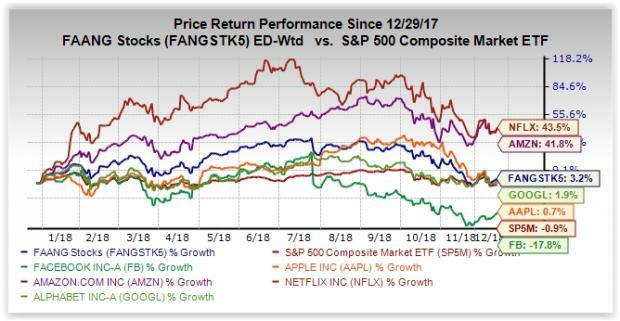 This is why it makes for a smart to invest in select tech stocks that returned double the FAANG group’s gains in 2018. In 2017, high-growth tech stocks were all the rage. The FAANG group had powered the post-recession rally to a significant extent and by the middle of last year, they looked all but invincible. However, by the third quarter of 2018, things began to unravel for the group until they suffered severe declines. By late November, all the FAANG names had lost more than 20% from their most-recent peak, pushing them into a bear market. With the U.S.-China trade war intensifying, macroeconomic concerns heightened, pushing investors toward defensive sectors. Additionally, the Fed seemed unwilling to shed its new found hawkishness. Stock-specific weaknesses also contributed to the group’s decline. At this point, Facebook FB is the worst performer of the group, down 17.8% year to date and more than a third lower than its recent July peak. Data privacy concerns, sparked off primarily by the Cambridge Analytica incident, has been the primary cause for this downturn. On Mar 19, the social media giant’s shares tanked 6.8%, recording its worst decline in four years, after it was accused of a data misuse scandal that affected the personal information of more than 80 million users. Apple AAPL and Alphabet GOOGL have also performed poorly, gaining 0.7% and 1.9% year to date. Also, Apple shares are down nearly 30% from the time when it was valued at a phenomenal $1 trillion. Questions about flagging iPhone demand have haunted the stock this year, forcing analysts to adopt a cautious approach. Coming to Alphabet and Amazon AMZN, both the tech majors’ most recent sales numbers lagged expectations. However, Amazon remains one of the most-successful members of the group, with shares up 41.8% year to date. The e-commerce giant’s entry into grocery services and its hugely successful Web Services are some of the factors keeping its successful run intact. Netflix NFLX is another stock which continues to show promise with shares up 43.5% year to date. Analysts also remain optimistic about its chances in the immediate future, but its stock seems pricey to many. Further, it has failed to escape the broad-based selling pressure created by the slump in sentiment. Currently, the Technology Select Sector SPDR (XLK) is up 3.5% year to date, a shade better than the FAANG group’s increase of 3.2% over the same period. The broader tech sector has also endured a volatile year, but could be on the verge of a major comeback. A large part of the debate now centers around whether we are witnessing the end of a correction or the start of a bear market. Despite lingering concerns, the U.S. economy is in far better shape than most of the rest of the world. A strong labor market and booming consumer confidence is fueling gains. Chances of a U.S.-China trade deal have increased over the last few weeks and if such an agreement does take place, tech stocks will look much more appealing. While opinion is divided over the prospects of FAANG members in 2019, the majority of analysts think tech remains a solid long-term prospect. After all, the sectors is made up of some of the most influential and rich companies in the world. One rocky year can hardly change these facts. But now it may make more sense to seek out smaller companies, especially those focusing on innovation. Given the lingering concerns over the pricing and valuation of bigger tech names, these could emerge as better long-term prospects. However, picking winning stocks may be difficult. We have narrowed down our search to the following stocks, each of which has a Zacks Rank #1 (Strong Buy) and a good VGM Score and has delivered returns twice as much as the FAANG group in 2018. You can see the complete list of today’s Zacks #1 Rank stocks here. eGain Corporation EGAN provides customer engagement solutions in the United States. eGain has a VGM Score of B. The company’s projected growth rate for the current year is 33.3%. The Zacks Consensus Estimate for the current year has improved more than 100% over the last 30 days. Dell Technologies Inc. DVMT is a provider of information technology solutions. Dell has a VGM Score of B. The stock is up 29.8% year to date. CACI International Inc. CACI delivers IT applications and infrastructure to improve communications and secure the integrity of information systems and networks, enhance data collection and analysis, and increase efficiency and mission effectiveness. CACI International has a VGM Score of B. The Zacks Consensus Estimate for the current year has improved 7.1% over the last 60 days. The stock is up 21.8% year to date. KEMET has a VGM Score of A. The company’s projected growth rate for the current year is 90.7%. The Zacks Consensus Estimate for the current year has improved 34.1% over the last 60 days. The stock is up 17.7% year to date. Diodes Incorporated DIOD is a leading manufacturer and supplier of high-quality discrete and analog semiconductor products. Diodes has a VGM Score of A. The company’s expected earnings growth for the current year is 71.5%. The Zacks Consensus Estimate for the current year has improved 8.3% over the last 60 days. The stock is up 14.6% year to date.